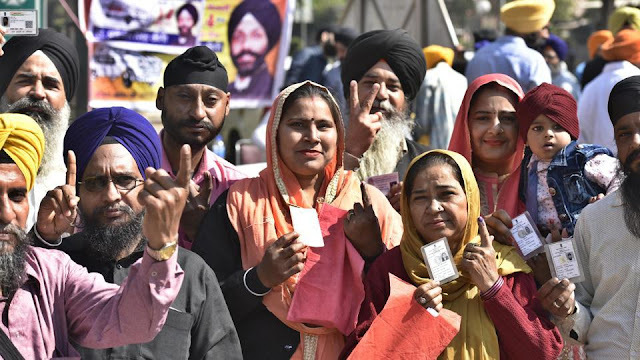 The polling for the Delhi Sikh Gurdwara Management Committee (DSGMC) on Sunday witnessed low turnout of 45.7%, but it was better than 42% recorded in the previous elections in 2013. Of the 3.8-lakh registered voters in 46 wards, only 1.75 lakh cast their vote this time. The percentage of Sikh men and women who voted on Sunday was near similar —46% females and 45.5% males. The polling to elect the body to manage the shrines, educational and medical institutions remained largely peaceful. The results will be out on March 1. The DSGMC has an annual budget of Rs 100 crore, a major portion of which is generated from donations at historical gurdwaras – Bangla Sahib, Sisganj Sahib and Rakabganj Sahib. Eighteen public schools run by the committee also add to its income. Of all the 46 wards where polling took place, Trinagar witnessed the highest voting of 66%, followed by Punjabi Bagh at 58%. Santgarh witnessed the lowest turnout of 28%. A fierce contest is on the cards in Punjabi Bagh between former DSGMC president Paramjit Singh Sarna and outgoing general secretary Manjinder Singh Sirsa. Sarna who remained DSGMC president for 10 years till 2013 was defeated by Sirsa in the previous elections. Outgoing president Manjit Singh GK contested from Greater Kailash, where turnout was 47.6%. Pundits have already predicted him an unchallenged winner from the ward. With Aam admi party (AAP) withdrawing active support to its Panthic Sewa Dal that contested in 40 wards, the elections became a two-cornered contest between Shiromani Akali Dal (Badal) and SAD (Delhi). Barring an incident of casting of 11 bogus votes in Sarupnagar, the polling remained peaceful. The said votes were cancelled. About 8,000 Delhi Police personnel were deployed on poll duty at 560 polling stations, of which 63 were declared as hypersensitive and 116 as sensitive, mostly in West Delhi. Director gurdwara election Shurbir Singh expressed satisfaction at the peaceful polls and the turnout. As per the Delhi Gurdwara Act-1971, functioning of the new DSGMC will begin immediately after declaration of results. The 46 elected members will co-opt two members from Singh Sabha gurdwaras of Delhi, two eminent Sikhs and one representative of the Amritsar-headquartered Shiromani Gurdwara Parbandhak Committee (SGPC). Four of five Sikh head priests are also the de facto members of the gurdwara committee, but they have no major role in the day-to-day functioning. Director, gurdwara elections, chairs the first meeting of the 46-member house to start the process of co-option. “The process takes about a month. After the house completes the process, it is handed over to the office-bearers to run the show,” said Shurbir Singh.